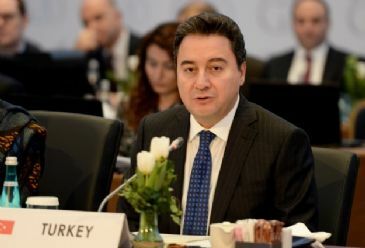 ANKARA – The Turkish central bank has the authority and responsibility to intervene on exchange rates, Deputy Prime Minister Ali Babacan said on Thursday. The central bank follows the development of the rate of exchange of the lira within the framework of controlling price stability, and it intervenes if necessary, Babacan, who is responsible for the economy, said in an interview with TRT -Turkish State Television. Babacan’s remarks came after the U.S. dollar jumped to a record high against the Turkish lira over 2.50 on Wednesday. The international economic context should be taken into consideration in the assessment of the rise of the dollar rate against Turkish lira. Babacan said that the international financial markets are passing through a period of very high volatility. The fall in the price of oil, the drop in the euro against the dollar were two examples Babacan cited. "So the dollar went much higher against the euro. In fact, the U.S. dollar has appreciated against many currencies in the world during period. Therefore, volatility is very high." Much economic volatility that Turkey is experiencing can be attributed to the high level of volatility in international markets, Babacan pointed out. Interest rates are a controversial topic in Turkey as government officials have repeatedly criticized the Central Bank's tight money policies as limiting economic growth. Babacan said that the government did not have an exchange rate target. Babacan said: "If you ask us every minister in the government, 'What is the exchange rate you prefer?' you will get a different answer from each one. Normally none of them needs to say anything. Because the government does not have a formally pronounced exchange rate target," Babacan said. "The final assessment done by the Central Bank Monetary Policy Committee after listening to everyone," Babacan added. "We do not believe that there should be a daily debate on exchange rates. Any country in which the rate is part of daily political polemics is ultimately harmed; there is a rising risk premium, because there is no stability in terms of interest rates." "We believe that it is important that all communication about exchange rates be made from a single channel, from the central bank, which has the authority and responsibility for it," Babacan said.